There are times when globalization truly hits home. For example, a couple of weeks ago we learned that because people in emerging nations now yearn to feed kibble to their dogs, Ralston-Purina Co. was being purchased by Nestle SA of Switzerland. And there are times when globalization shakes you down to your very soles. The announcement Monday by Converse Inc., of North Reading, Mass., that it was seeking Chapter 11 bankruptcy protection and getting out of the shoe manufacturing business was one of those times. If you are a male of a certain age, the name Converse means only one thing: Converse “Chuck Taylor” All Star basketball shoes, sometimes known as “Cons,” better known as “chucks.” And the very mention of chucks will evoke all sorts of sensory pleasures. The feel of eight dollar bills wadded up in the pocket of your jeans, handed over one by one in exchange for a long, narrow box. Inside wrapped in tissue paper are a pair of black, high-top chucks, smelling of canvas and glue and rubber and glory. Especially glory. Long before Michael Jordan was a gleam in James Jordan’s eye, men like Bill Russell and Bob Cousy, Bob Pettit and Oscar Robertson were wearing chucks and defining the game of basketball. Giants walked the earth, and the giants wore chucks. Chuck Taylor was not a giant. He was a semi-pro player for the Akron Firestones who needed a job. 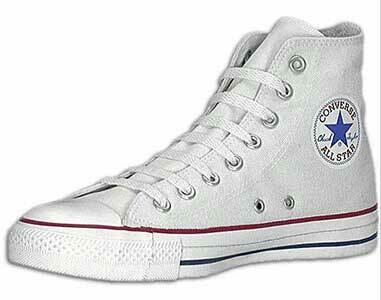 So in 1921 he went to work for Converse as the Apostle of the Basketball Shoe. He was so good at it that two years [actually eleven, ed.] later Converse put his autograph on the shoe. And chucks were born. For nearly 50 years, they were The Shoe. Mr. Taylor himself died in 1969, just as the athletic shoe business started getting complicated. Converse was slow to react to the challenges brought by Nike and Adidas, but it enioyed a brief resurgence in the 1980s thanks to endorsement deals with Julius Erving, Larry Bird and Ervin (Magic) Johnson. The company was purchased by St. Louis-based Interco in 1986, but spun back into a separate company in 1994 as part of Interco’s bankruptcy reorganization. Through it all, chucks remained doggedly popular, though not as a basketball shoe (to tell the truth, they were kind of hard on your feet) but as a styling shoe. As a funky, kick-back shoe in nine basic colors and a rainbow of seasonal colors and patterns (i.e., banana, taupe, lilac blue, fluorescent green). As the shoe worn by Nirvana’s Kurt Cobain to usher in Grunge. As the favored footwear of Iggy Pop and Tom Petty. Chucks had new life. Even chicks wore chucks. I preferred the white ones myself, high tops of course. I got my first pair in high school, from the basketball coach. They were “seconds” — the coach knew a guy at the factory and got them cheap. I didn’t care. They were chucks, not the Sears no-names mom bought. Wearing those chucks, I scored three points. In my senior year. In intramurals. As Spike Lee might have sald, it wasn’t the shoes. My sons sneered at chucks. They wanted air-cushion, low-pronation, pump-up, zip-up, pay-up shoes that looked like they’d been designed by NASA. My daughter came along and for a while wore a pair of red-and-green chucks with Christmas bells on them. I suggested she could wear them for basketball, too. She gave me one of Those Looks. You’ll still be able to buy chucks, but thanks to globalization, they’ll be made in Indonesia. Converse, after its bankruptcy reorganization, will live on as a licensing company. Converse says they’ll be indistinguishable from American chucks. Uh-huh. Maybe I’ll buy a pair anyway. I can wear them to feed the dogs.